Until now I’ve been powering the water quality sensors via a USB cable either to an external power supply, or directly to my laptop for debugging. For the sensors to work in the real world they’ll need to have at least a day’s battery life if not a week to be useable. I can imagine going for a walk every weekend to replace rechargeable batteries would be fine, but any shorter than that might get a bit tedious. I have a few friends in the mobile phone repair business, and they gave me a supply of phone batteries that were past their prime for supplying high amp outputs, but seem to be fine for a regular trickle like this project. So I’m hoping that maybe I can make use of a bunch of those 3.7v 1050mAh batteries and give them a new life. To get their 3.7v up to 5v that The Things Uno uses, I’ll need a boost converter – so have been playing with this Adafruit 1000c. Adafruit 1000C boost converter & recycled Nokia 3.7v 1050mAh battery. This setup works very nicely, but given that these batteries are quite old I’d expect to only get about 85% of their original capacity from them. So let’s do a little test. To my utter surprise, I actually got ~5 hours out of the old Nokia battery or about 90% of it’s original life. And that’s including the boost converter efficiency loss too. So things are looking good. But in the meantime, it’s nice to see it all fit in the water-proof case, and transmit for 5 hours without a problem! 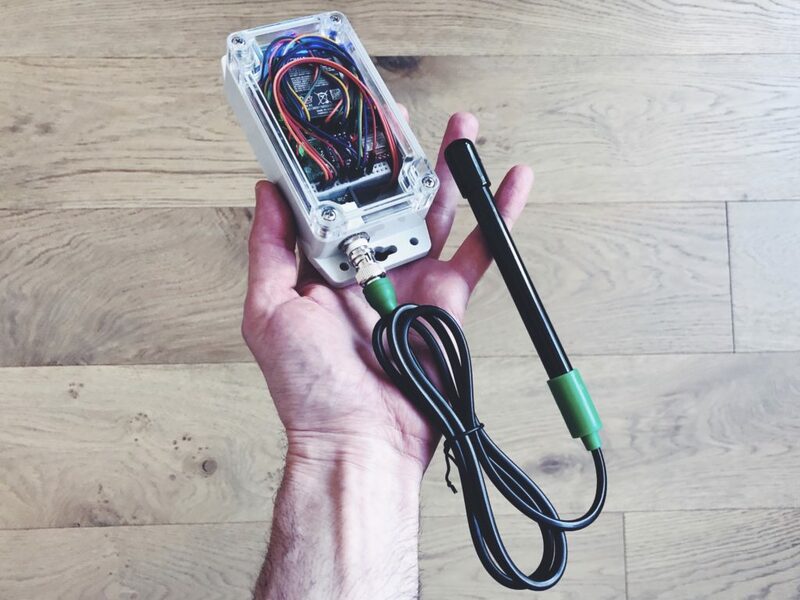 All of the components fit snugly in this water-proof enclosure. LoRa is great when there’s a network available, but for in-person water quality readings I thought it’d be convenient to add Bluetooth. I had a spare BLE Nano v2 sitting around, so decided to wire that in. 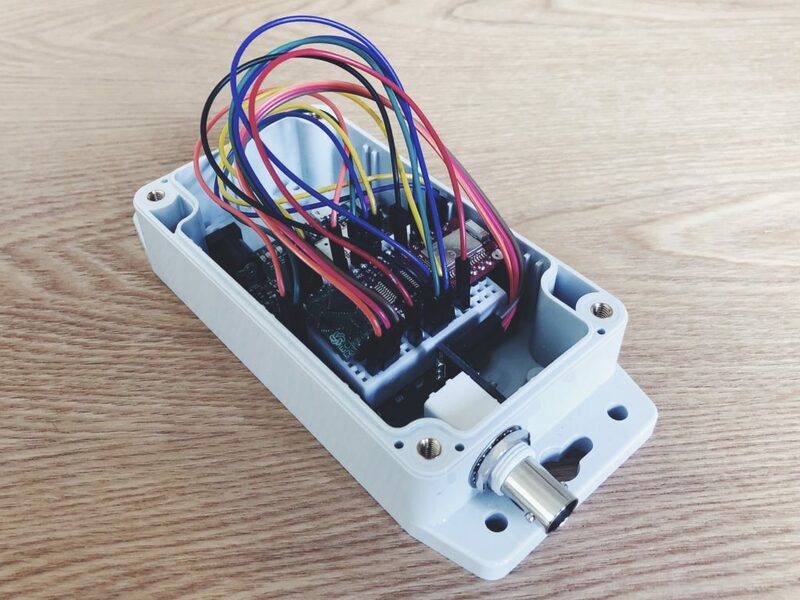 It acts as a relay, broadcasting everything that the Water Quality sensor outputs over serial, and pushing it out via Bluetooth. 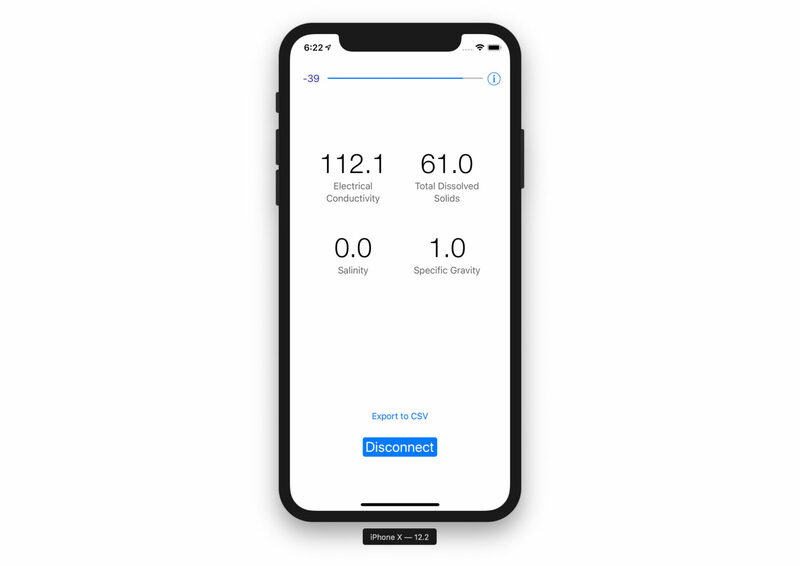 Because this is the same setup as my air quality sensor project, I could clone the Air Quality iOS app to become a Water Quality iOS app. The app saves all of the data to my iPhone/iPad’s Core Database, and there’s an export to CSV function too. Quick graph of the first sensor data I measured. Sample data: Google Spreadsheet / Raw CSV. It’s pretty snug on the mini breadboard, and I cheated a bit by adding in the 3.3v BLE board on the wrong side of the power isolator to avoid having to drop down the 5v TX pin from the Arduino side to 3.3v, but it all still fits in the waterproof enclosure and functions very nicely. The Bluetooth BLE board is the red one on the right. 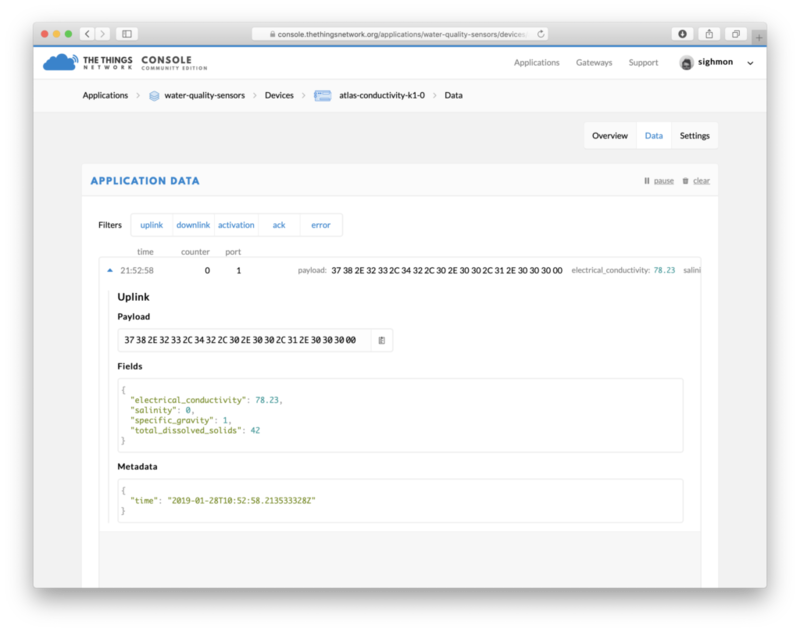 Next step is to update my Rails site to be able to include water quality data, add some API authentication, and host it. 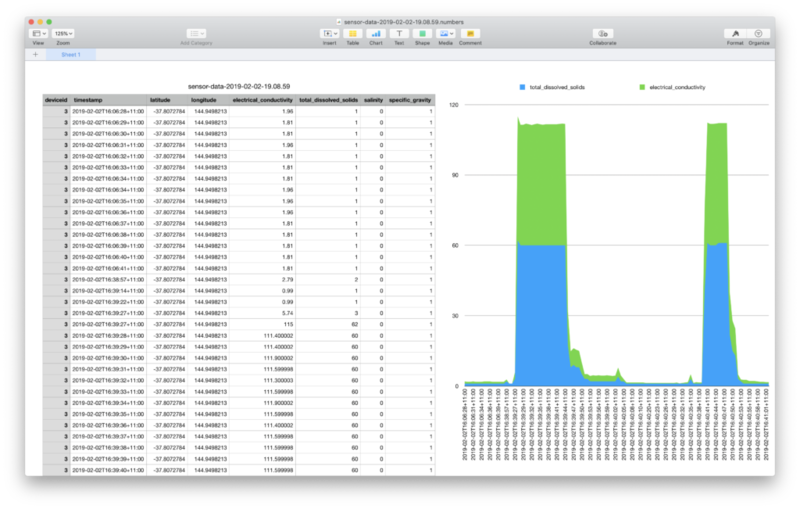 Then all of the data the iOS apps are getting will be posted to a database and graphed nicely, both on a linear graph, and on a map. Check your coverage, keys and backend status. I’d tried five different locations across two states, so was getting pretty paranoid that it was either something I’d done in my Arduino water quality sensor reading code (I was using Software Serial). So I asked Leo from TTN Adelaide if it might be possible for him to send me a known working Uno so that I could try it here using stock software. His setup was identical to the one I had been trying, but at least we could rule out hardware failure, and it’d tell me a lot more about trusting my code. As soon as it arrived I plugged it into my USB power brick so that my laptop couldn’t do anything weird to it (super paranoid), but it didn’t connect successfully. So after a couple of minutes I plugged it into my laptop so I could read the serial monitor output. Same output as mine. So at this point I could at least feel a little better about my code and hardware, but it was still a bit of a mystery why all of the locations I’d tried didn’t work. I wandered around the Melbourne CBD with it switched on, monitoring TTN console on my phone for uploads… still nothing. In a last ditch effort to find some signal, I got myself onto a 38th floor rooftop, switched it on, and almost instantly the join confirmation and payloads started streaming in. So it was just blackspots all over the Melbourne CBD, East St Kilda, Southbank, Adelaide CBD and Port Willunga. Next thing to do was to test the payload to see if I was sending a readable byte array. So that’s great! It works. The Things Network console also has a really nice feature where you can decode your byte array into something more human readable, it’s the Payload Formats tab. It’s very simple, with no error handling or validation (though there is a validation tab when I get some more time). There’s also a neat Payload Test field, where you can test your decoder as you write it. After I’d ironed out the bugs I switched back over to the Data tab and saw it all working! Success! 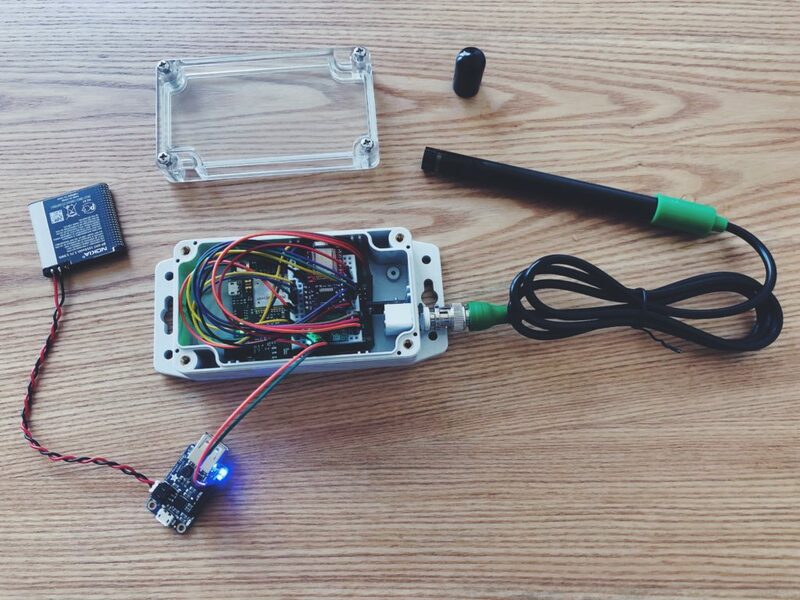 The water quality sensor payload is decoded and displayed. Next step: writing some kind of integrator, so that it can send the data onto a database for visualisation. Click ‘RN Module 0’ from the left. So it looks like C:\\ is hardcoded as the default location, which appears to be why it’s failing unless there’s a default path set (which there isn’t on first run). This was reported to Microchip in 2016 so is unlikely to be fixed anytime soon. 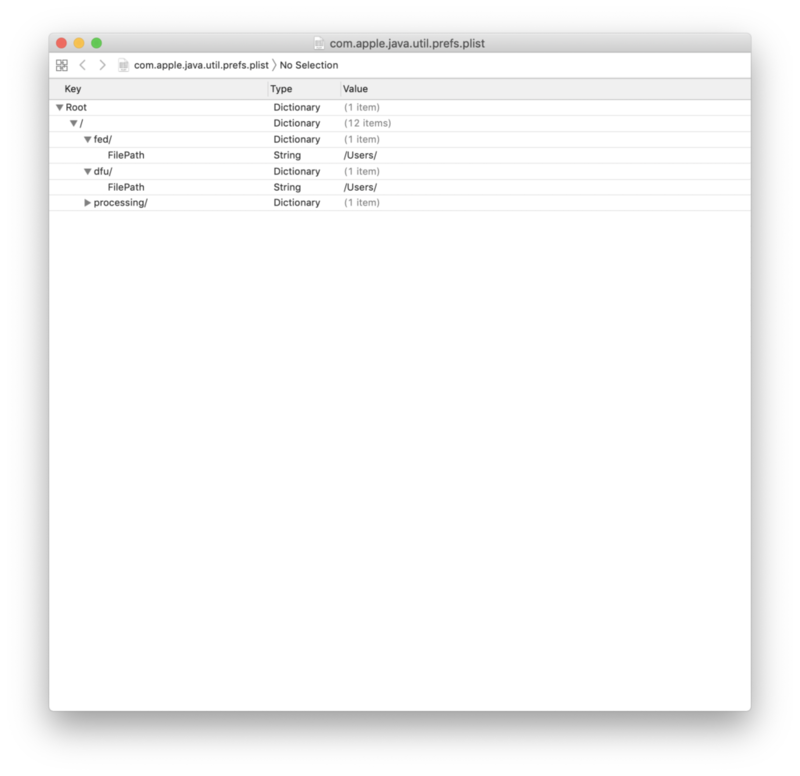 Search for com.apple.java.util.prefs in the finder window. Don’t do what I did and select the unzipped folder, instead copy the file RN2903_Parser.production.unified.hex to the Desktop and select it from there. Now that I know the sensor works with a standard Arduino Mega, it’s time to try and get it running on The Things Uno. My first attempts getting the Atlas Scientific Uno code running on The Things Uno didn’t get very far. It seemed to be a problem running SoftwareSerial on the default pins 2 & 3. But when I moved those to pins 10 & 11, I started getting output on the serial monitor! Success. Next step was to merge that sample code with The Things sample code and see if it all still compiled and ran. More success! 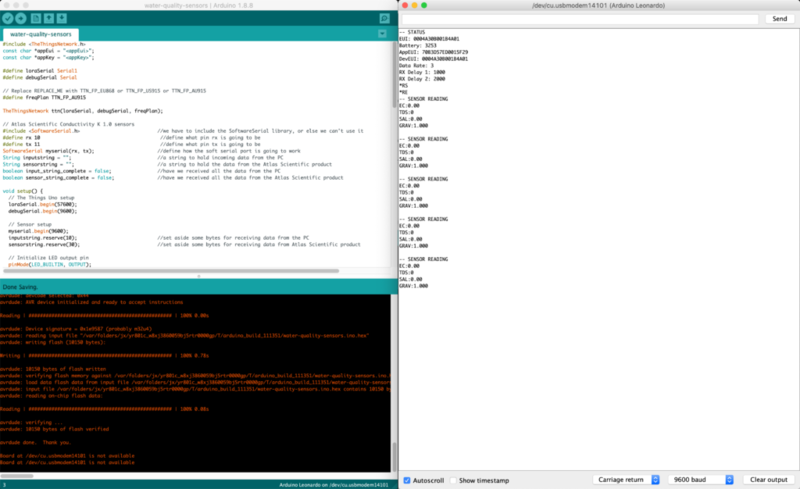 The output from the serial monitor of the Arduino IDE. The final step is to convert the sensorstring to a byte array so that we can send it to The Things Network. 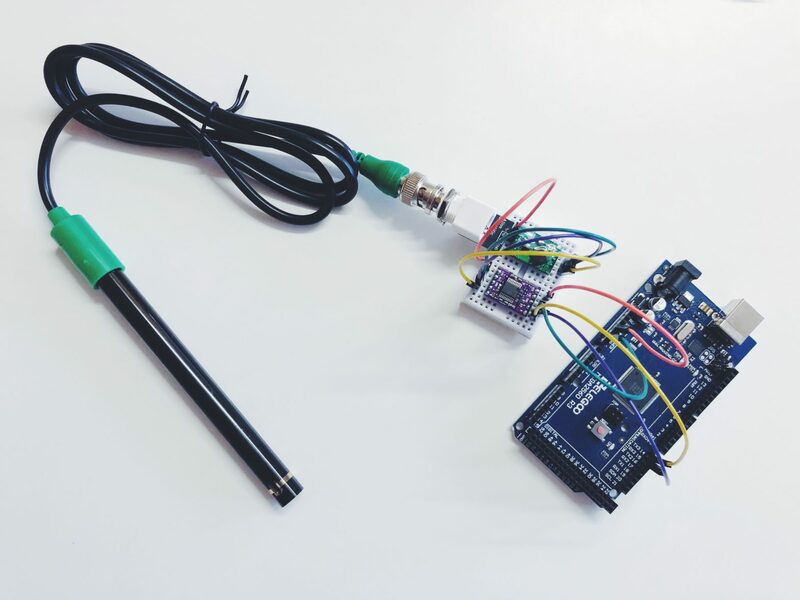 Connecting an Atlas Scientific Conductivity K 1.0 sensor to an Arduino. 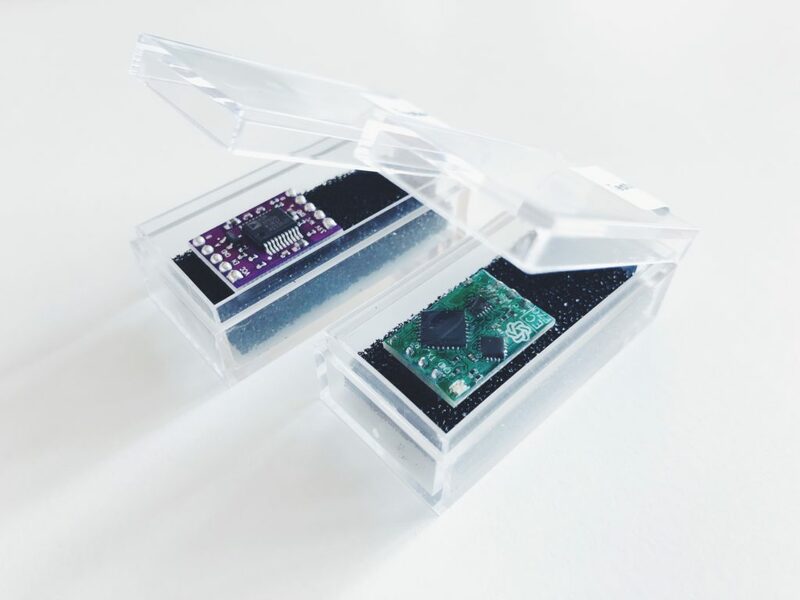 First of all, let me just say that I adore the packaging of the EZO conductivity and power isolation circuit boards. They arrived in two adorable little cryogenic chambers. They were a lot smaller than I expected, which is a nice surprise, as it’ll mean a smaller end product once I’ve packaged them all into a box. The EZO Conductivity Circuit Datasheet is more like a getting started guide, so I followed that first. Finding a spare breadboard, I wired the EZO board to the voltage isolator (which is optional so that any other devices don’t interfere with the conductivity sensor), and then to an Arduino Mega. I thought it better to test it with a plain Arduino before migrating over to The Things Uno, as I haven’t looked into whether the standard serial pins are still usable or not. The Arduino Mega wiring diagram. The Arduino Mega sample code. Wiring diagram without the power isolator. Wiring diagram with the power isolator. Atlas Scientific Conductivity K 1.0 connected to an EZO board, via a power isolation board, to an Arduino Mega. With everything connected I uploaded the sample code to the Arduino, opened the serial monitor and out came my first data! So it works! But what do those values mean and how do they compare to reported averages? Port Willunga’s average that I read of 326 mg/L (only a few readings on one day) sits towards the Myponga end of those two readings, which seems to validate the data I just read. Just out of interest, on page 54 of that report, the “Aesthetic guideline” for water TDS is less than or equal to 600 mg/L. So I think that’s a safe upper limit to compare against for drinking water. Update: I found that the SA Water “what’s in your water” search returned this 2018 data from South Metro: Average 290 mg/L. So that’s in the same ballpark too which is nice. Next step is to get it working with I2C on The Things Uno, so that I can push the data to their network. I might also build a quick iOS Bluetooth app and plug it into my Red Bear BLE Nano so that I can send data to my phone too. Out of the box The Things Uno has all the code on it to get started. All I needed to do was plug it into my laptop and open a serial monitor in the Arduino IDE at 9600 baud. Green lights flashed, and its status printed to the console. Happy days. I followed the Uno Quick Start guide (which is really great), updated my Arduino IDE, added TheThingsNetwork library, setup my Application, added my device to the application, copied the appEui & appKey to my example sketch and uploaded it. Join not accepted: denied. Check your coverage, keys and backend status. 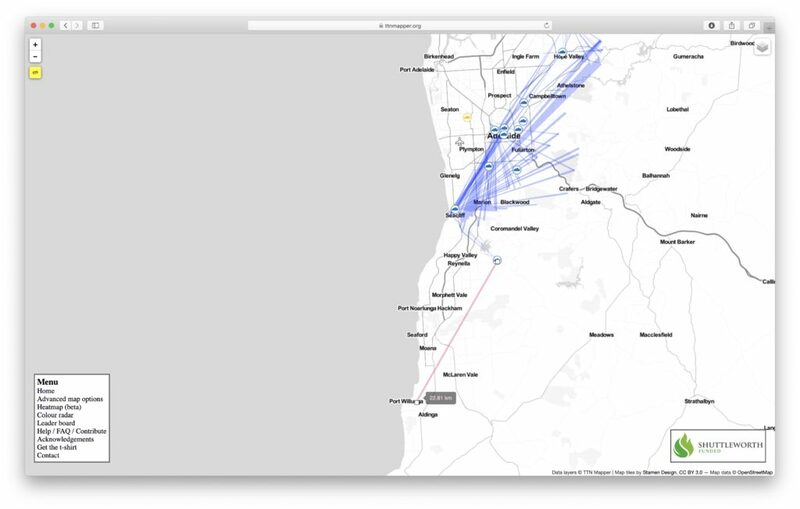 Double checking the sample code and keys didn’t find any bugs, so it was time to look at The Things Network Mapper to see if I was actually in range here at Port Willunga. December 2018, Port Willunga is out of range. Bummer. ~22.8km away from the nearest gateway, and the theoretical range of LoRaWAN is ~15km. So I’ll take a break from connecting to the network and get back to getting The Things Uno talking to the Atlas Scientific Water Conductivity sensor. Then when that’s all sorted, I’ll take a little drive down the coast and connect that way. Update: Once I reached Adelaide CBD I plugged in The Things Uno again in the hope it would connect to the many close gateways… but unfortunately I had the same problem. 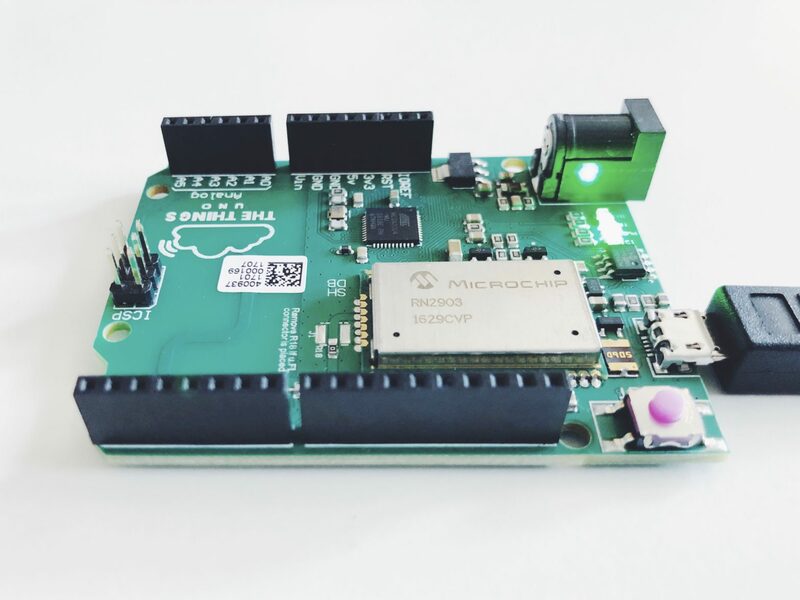 A quick chat in the #Adelaide channel on thethingsnetwork.slack.com and Andrew noticed that my Uno’s LoRaWAN firmware on the Microchip RN2903 is running old firmware (Version 0.9.5), and apparently it needs to be running Version 1.0.3 to connect. Six months ago I moved to Williamstown Beach just outside of Melbourne. It’s a nice beachside town about 15km from the centre of the city. The beach is a couple of blocks away via a walk through the botanic gardens – a pretty ideal place to replenish after long days in front of computers (my day jobs include being a software developer for ACMI and New Internationalist). The beach here has a really diverse crowd – many countries of Africa are represented, as well as a large portion of southern Europe and Asia. It’s a really popular place for both families with young kids and pets, as well as groups of teenage and 20-something friends. But there is one blot on this otherwise idyllic bay, and that’s a big waste water drain that exits right next to the swimming beach. A waste water drain wouldn’t be so much of a big deal on its own, but Williamstown’s proximity to a large shipping port, industrial area, and oil refinery made me curious to see whether the output of it is at all tainted. That curiosity peaked after a recent factory fire and subsequent rains forced the local council to put up signs warning that the water was unfit to swim in or even for pets to play in. EPA Victoria has a twitter account that tweets water quality for beaches, but it doesn’t seem to have an entry for Williamstown and some of the alerts are based on historical data. So I decided to start building my own monitoring system, to see what the cost would be to setup alerts of my own. My first stop was the Public Lab Water Quality Sensor project. Being five years old there are a lot of broken links, but there was one that was useful – the link to Atlas Scientific sensors. Given the cost of Atlas sensors (~AUD$415 each delivered), I figured for my first tests I might choose one and see how it goes. Then buy more if that one ends up being useful. 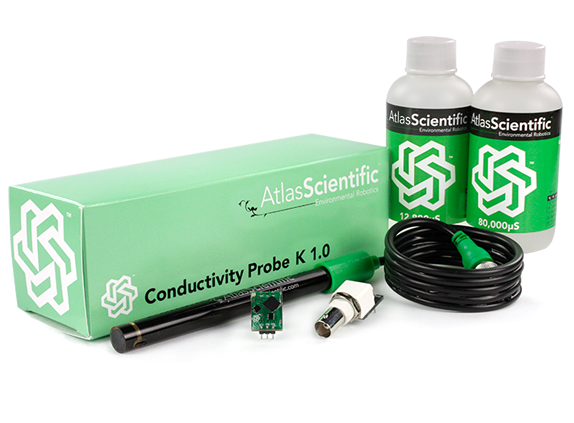 So with that in mind, I decided on the Conductivity K 1.0 kit. $400 is about double my comfortable limit for hobby projects, so I put the feelers out on the Hackerspace Adelaide list & Twitter to see if anyone wanted to share the cost and the sensors. 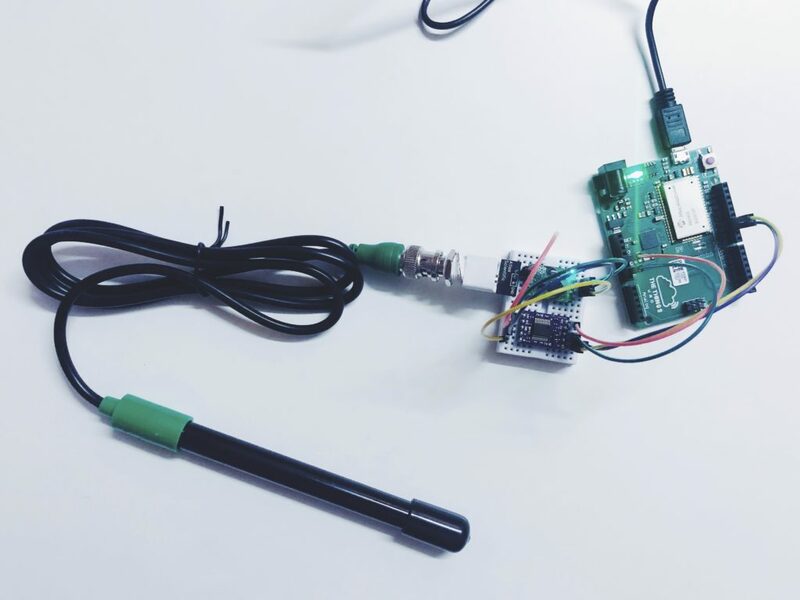 Almost instantly, Jeannine very kindly put me onto Leo and The Things Network, who not only got TTN to donate me a The Things Uno with LoRaWAN (Low power, wide area network with ~15km range), but also agreed to sponsor me $100 towards the costs of the sensors (THANK YOU!). Big shout out to Tisham Dhar of Whatnick fame too, who also offered to help out (Tisham makes open hardware energy monitors that are awesome). The TPS would probably work nicely (The Bluelab is seemingly a standalone reader). But seeing I wanted to open this up as public data, and have the possibility of an easily replicated solution, I decided to go with off-the-shelf products that have great documentation, Arduino sample code, wiring diagram and calibration samples (seriously, how nice is their documentation!!!). 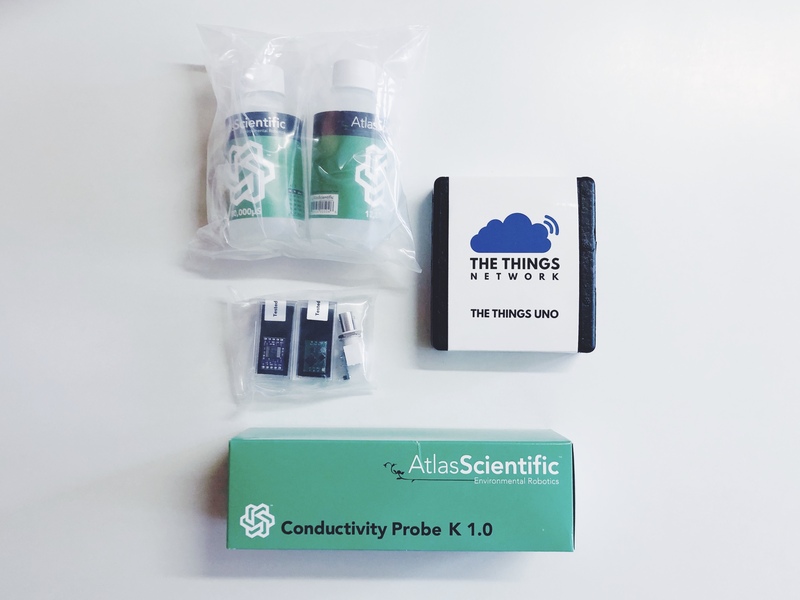 Atlas Scientific and Leo from The Things Network were super prompt with their deliveries, they were each really nicely packaged and arrived within a week – a nice start to any project. Connect to The Things Network. Connect the sensor and get usable data. Welcome to my little home on the internet, where I release the frustrations and successes of my side projects, my error therapy. Error Therapy, Proudly powered by WordPress.